For other uses, see Birch (disambiguation). Birch species are generally small to medium-sized trees or shrubs, mostly of northern temperate and boreal climates. The simple leaves are alternate, singly or doubly serrate, feather-veined, petiolate and stipulate. They often appear in pairs, but these pairs are really borne on spur-like, two-leaved, lateral branchlets. The fruit is a small samara, although the wings may be obscure in some species. They differ from the alders (Alnus, other genus in the family) in that the female catkins are not woody and disintegrate at maturity, falling apart to release the seeds, unlike the woody, cone-like female alder catkins. The bark of all birches is characteristically marked with long, horizontal lenticels, and often separates into thin, papery plates, especially upon the paper birch. Distinctive colors give the common names gray, white, black, silver and yellow birch to different species. The buds form early and are full grown by midsummer, all are lateral, no terminal bud is formed; the branch is prolonged by the upper lateral bud. The wood of all the species is close-grained with a satiny texture and capable of taking a fine polish; its fuel value is fair. The flowers are monoecious, opening with or before the leaves and borne once fully grown these leaves are usually 3–6 millimetres (1⁄8–1⁄4 in) long on three-flowered clusters in the axils of the scales of drooping or erect catkins or aments. Staminate aments are pendulous, clustered or solitary in the axils of the last leaves of the branch of the year or near the ends of the short lateral branchlets of the year. They form in early autumn and remain rigid during the winter. The scales of the staminate aments when mature are broadly ovate, rounded, yellow or orange color below the middle, dark chestnut brown at apex. Each scale bears two bractlets and three sterile flowers, each flower consisting of a sessile, membranaceous, usually two-lobed, calyx. Each calyx bears four short filaments with one-celled anthers or strictly, two filaments divided into two branches, each bearing a half-anther. Anther cells open longitudinally. The pistillate aments are erect or pendulous, solitary; terminal on the two-leaved lateral spur-like branchlets of the year. The pistillate scales are oblong-ovate, three-lobed, pale yellow-green often tinged with red, becoming brown at maturity. These scales bear two or three fertile flowers, each flower consisting of a naked ovary. The ovary is compressed, two-celled, and crowned with two slender styles; the ovule is solitary. Each scale bears a single small, winged nut that is oval, with two persistent stigmas at the apex. Betula species are organised into five subgenera. Note: many American texts have B. pendula and B. pubescens confused, though they are distinct species with different chromosome numbers. The common name birch comes from Old English birce, bierce, from Proto-Germanic *berk-jōn (cf. German Birke, West Frisian bjirk), an adjectival formation from *berkōn (cf. Dutch berk, Low German Bark, Danish birk, Norwegian bjørk), itself from the Proto-Indo-European root *bʰerHǵ- ~ bʰrHǵ-, which also gave Lithuanian béržas, Latvian Bērzs, Russian beréza, Ukrainian beréza, Albanian bredh ‘fir’, Ossetian bærz(æ), Sanskrit bhurja, Polish brzoza, Latin fraxinus ‘ash (tree)’. This root is presumably derived from *bʰreh₁ǵ- ‘to shine’, in reference to the birch's white bark. The Proto-Germanic rune berkanan is named after the birch. The generic name betula is from Latin, which is a diminutive borrowed from Gaulish betua (cf. Old Irish bethe, Welsh bedw). Birches often form even-aged stands on light, well-drained, particularly acidic soils. They are regarded as pioneer species, rapidly colonizing open ground especially in secondary successional sequences following a disturbance or fire. Birches are early tree species to become established in primary successions, and can become a threat to heathland if the seedlings and saplings are not suppressed by grazing or periodic burning. Birches are generally lowland species, but some species, such as Betula nana, have a montane distribution. In the British Isles, there is some difference between the environments of Betula pendula and Betula pubescens, and some hybridization, though both are "opportunists in steady-state woodland systems". Mycorrhizal fungi, including sheathing (ecto)mycorrhizas, are found in some cases to be beneficial to tree growth. A large number of lepidopteran insects feed on birch foliage. Because of the hardness of birch, it is easier to shape it with power tools; it is quite difficult to work it with hand tools. Birch plywood is made from laminations of birch veneer. It is light but strong, and has many other good properties. It's among the strongest and dimensionally most stable plywoods, although it is unsuitable for exterior use. Birch plywood is used to make longboards (skateboard), giving it a strong yet flexible ride. It is also used (often in very thin grades with many laminations) for making model aircraft. Extracts of birch are used for flavoring or leather oil, and in cosmetics such as soap or shampoo. In the past, commercial oil of wintergreen (methyl salicylate) was made from the sweet birch (Betula lenta). Birch-tar or Russian oil extracted from birch bark is thermoplastic and waterproof; it was used as a glue on, for example, arrows, and also for medicinal purposes. Fragrant twigs of silver birch are used in saunas to relax the muscles. 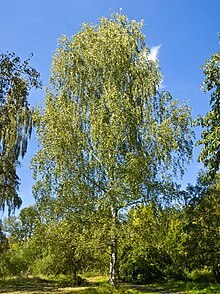 Birch is also associated with the feast of Pentecost in Central and Eastern Europe and Siberia, where its branches are used as decoration for churches and homes on this day. Birch leaves are used to make a diuretic tea and extracts for dyes and cosmetics. Ground birch bark, fermented in sea water, is used for seasoning the woolen, hemp or linen sails and hemp rope of traditional Norwegian boats. Birch twigs bound in a bundle, also called birch, were used for birching, a form of corporal punishment. Many Native Americans in the United States and Indigenous peoples in Canada prize the birch for its bark, which because of its light weight, flexibility, and the ease with which it can be stripped from fallen trees, is often used for the construction of strong, waterproof but lightweight canoes, bowls, and wigwams. The Hughes H-4 Hercules was made mostly of birch wood, despite its better-known moniker, "The Spruce Goose". Birch plywood was specified by the BBC as the only wood that can be used in making the cabinets of the long-lived LS3/5A loudspeaker. Birch is used as firewood because of its high calorific value per unit weight and unit volume. It burns well, without popping, even when frozen and freshly hewn. The bark will burn very well even when wet because of the oils it contains. With care, it can be split into very thin sheets that will ignite from even the smallest of sparks. Birch sap is a traditional drink in Northern Europe, Siberia, and Northern China. The sap is also bottled and sold commercially. Birch sap can be used to make birch syrup, which is used like maple syrup for pancakes and waffles. Birch wood can be used to smoke foods. Birch seeds are used as leaf litter in miniature terrain models. Birch oil is used in the manufacture of Russia leather, a water-resistant leather. White-barked birches in particular are cultivated as ornamental trees, largely for their appearance in winter. The Himalayan birch, Betula utilis, especially the variety or subspecies jacquemontii, is among the most widely planted for this purpose. It has been cultivated since the 1870s, and many cultivars are available, including 'Doorenbos', 'Grayswood Ghost' and 'Silver Shadow'; 'Knightshayes' has a slightly weeping habit. Other species with ornamental white bark include Betula ermanii, Betula papyrifera, Betula pendula and Betula raddeana. Birch buds are used in folk medicine. In northern latitudes, birch is considered to be the most important allergenic tree pollen, with an estimated 15–20% of hay fever sufferers sensitive to birch pollen grains. The major allergen is a protein called Bet v I.
Birches are in use in Russia for health and a healthy skin since ancient times. Wood pulp made from birch gives relatively long and slender fibres for a hardwood. The thin walls cause the fibre to collapse upon drying, giving a paper with low bulk and low opacity. The birch fibres are, however, easily fibrillated and give about 75% of the tensile strength of softwood. [clarification needed] The low opacity makes it suitable for making glassine. In India, the birch (Sanskrit: भुर्ज, bhurja) holds great historical significance in the culture of North India, where the thin bark coming off in winter was extensively used as writing paper. Birch paper (Sanskrit: भुर्ज पत्र, bhurja patra) is exceptionally durable and was the material used for many ancient Indian texts. The Roman period Vindolanda tablets also use birch as a material on which to write and birch bark was used widely in ancient Russia as note paper (beresta) and for decorative purposes and even making footwear. Baltic birch is among the most sought-after wood in the manufacture of speaker cabinets. Birch has a natural resonance that peaks in the high and low frequencies, which are also the hardest for speakers to reproduce. This resonance compensates for the roll-off of low and high frequencies in the speakers, and evens the tone. Birch is known for having "natural EQ". Drums are often made from birch. Prior to the 1970s, it was one of the most popular drum woods. Because of the need for greater volume and midrange clarity, drums were made almost entirely from maple until recently,[clarification needed] when advances in live sound reinforcement and drum microphones have allowed the use of birch in high-volume situations. Birch drums have a natural boost in the high and low frequencies, which allows the drums to sound fuller. Birch wood is sometimes used as a tonewood for semiacoustic and acoustic guitar bodies, and occasionally for solid-body guitar bodies. It is also a common material used in mallets for keyboard percussion. Birches have spiritual importance in several religions, both modern and historical. In Celtic cultures, the birch symbolises growth, renewal, stability, initiation and adaptability because it is highly adaptive and able to sustain harsh conditions with casual indifference. Proof of this adaptability is seen in its easy and eager ability to repopulate areas damaged by forest fires or clearings. Birches are also associated with the Tír na nÓg, the land of the dead and the Sidhe, in Gaelic folklore, and as such frequently appear in Scottish, Irish, and English folksongs and ballads in association with death, or fairies, or returning from the grave. The leaves of the silver birch tree are used in the festival of St George, held in Novosej and other villages in Albania. The birch is New Hampshire's state tree and the national tree of Finland and Russia. The birch is a very important element in Russian culture and represents the grace, strength, tenderness and natural beauty of Russian women as well as the closeness to nature of the Russians. It's associated with marriage and love. There are numerous folkloric Russian songs in which the birch tree occurs. The Ornäs birch is the national tree of Sweden. The Czech word for the month of March, Březen, is derived from the Czech word bříza meaning birch, as birch trees flower in March under local conditions. The silver birch tree is of special importance to the Swedish city of Umeå. In 1888, the Umeå city fire spread all over the city and nearly burnt it down to the ground, but some birches, supposedly, halted the spread of the fire. To protect the city against future fires, it was decided to plant silver birch trees all over the city. Umeå later adopted the unofficial name of "City of the Birches (Björkarnas stad)". Also, the ice hockey team of Umeå is called Björklöven, translated to English "The Birch Leaves". "Swinging" birch trees was a common game for American children in the nineteenth century. American poet Lucy Larcom's "Swinging on a Birch Tree" celebrates the game. The poem inspired Robert Frost, who pays homage to the act of climbing birch trees in his more famous poem, "Birches". Frost once told "it was almost sacrilegious climbing a birch tree till it bent, till it gave and swooped to the ground, but that's what boys did in those days". ^ "World Checklist of Selected Plant Families: Royal Botanic Gardens, Kew". apps.kew.org. ^ Ashburner, K. & McAllister, H.A. (2013). The genus Betula: a taxonomic revision of birches: 1-431. Royal Botanic Gardens, Kew. ^ Keeler, Harriet L. (1900). Our Native Trees and How to Identify Them. New York: Charles Scribner's Sons. pp. 295–297. ^ Kinver, Mark (30 September 2015). "UK team germinates critically endangered Japanese birch". BBC News. BBC. Retrieved 30 September 2015. ^ Birches. (A Symposium, Royal Botanic Garden, Edinburgh 24–26 September 1982. Proceedings of the Royal Society of Edinburgh, 85B, 1–11, 1984. ^ "Birch". Wood Magazine. Retrieved December 1, 2013. ^ "Birch Tar – How to collect it". Archived from the original on February 27, 2008. ^ Joyce, Daniel. "Birch Seed Leaves". reapermini.com. ^ Bartlett, Paul (2015). "White-barked birches". The Plantsman (New Series). 14 (3): 146–151. ^ William Arthur Clark (January 1, 1937). "History of Fracture Treatment Up to the Sixteenth Century". The Journal of Bone and Joint Surgery. Needham, MA, USA: The Journal of Bone and Joint Surgery, Inc. 19 (1): 61–62. Another method cited was that of splints made of birch bark soaked in water until quite soft. They were then carefully fitted to the limb and tied with bark thongs. On drying, they became stiff and firm. There is no record of the use of extension, but, nevertheless, very few crippled and deformed Indians were to be seen. ^ Nanko, Hiroki; Button, Alan; Hillman, Dave (2005). The World of Market Pulp. USA: WOMP, LLC. pp. 192–195. ISBN 0-615-13013-5. ^ "Traditional celebrations in Novosej". RASP. Retrieved August 28, 2013. ^ "The Birch: Russia's Tree | News & Info". kurochkaclothing.com. Retrieved 2018-09-24. ^ 1932-1996., Weiss, Peg, (1995). Kandinsky and Old Russia : the artist as ethnographer and shaman. Kandinsky, Wassily, 1866-1944. New Haven: Yale University Press. p. 36. ISBN 0300056478. OCLC 30701876. ^ Pfileger, Pat. "Our Young Folks: Swinging on a Birch-Tree, by Lucy Larcom & Winslow Homer (1867)". Merry Coz. ^ Fagan, Deirdre J. (2007). Critical Companion to Robert Frost: A Literary Reference to His Life and Work. Infobase Publishing. p. 42. ISBN 978-1-4381-0854-4. Retrieved 10 November 2013. ^ Parini, Jay (1999). Robert Frost: A Life. New York: Halt. p. 22. ISBN 0-8050-3181-2. Furlow, John J. (1997). "Betula". In Flora of North America Editorial Committee (ed.). Flora of North America North of Mexico (FNA). 3. New York and Oxford – via eFloras.org, Missouri Botanical Garden, St. Louis, MO & Harvard University Herbaria, Cambridge, MA. Li, Pei-chun; Skvortsov, Alexei K. "Betula". Flora of China. 4 – via eFloras.org, Missouri Botanical Garden, St. Louis, MO & Harvard University Herbaria, Cambridge, MA. Grimshaw, John (2009). New Trees, Recent introductions to cultivation. Kew Publishing, RBG Kew. pp. 163–174. Chisholm, Hugh, ed. (1911). "Birch" . Encyclopædia Britannica. 3 (11th ed.). Cambridge University Press. Wikimedia Commons has media related to Betula. Eichhorn, Markus (July 2010). "The Birch Tree". Test Tube. Brady Haran for the University of Nottingham.